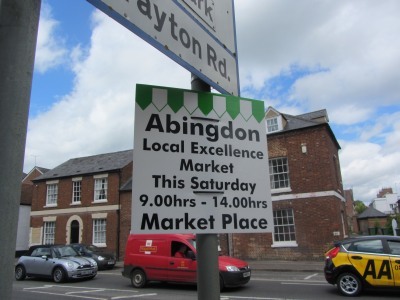 There were a record 33 stalls at the Local Excellence Market organised by the Abingdon-on-Thames Chamber of Commerce, and all week there have been notices up to advertise the event. 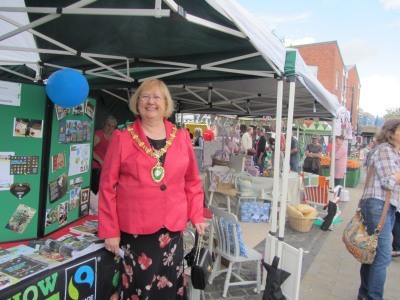 The Mayor, Monica Lovatt, walked through to have a look around on the way to Abingdon School where today is prize giving. 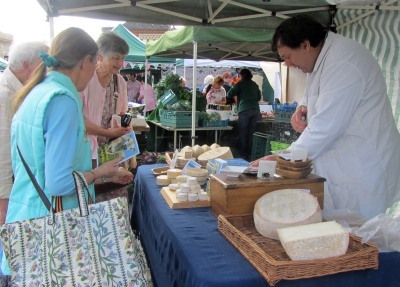 There were a mix of chamber members, and stalls from the Farmers Market such as the cheese man. 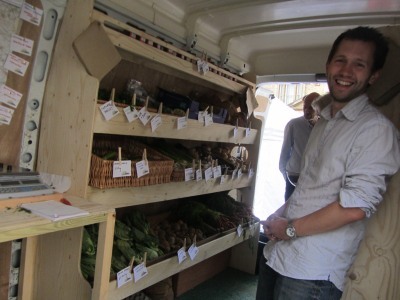 There were also craft stalls such as the The Pathway Workshop. This young lady was painting one of their signs before taking it home. 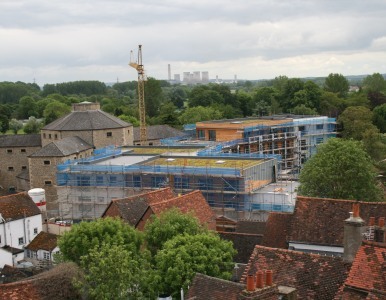 Looking down on the Old Gaol it appears that about half the flat roofs on the new build will have vegetation. The Old Gaol website says, in the sustainability section “Sustainability features include: Green roof technology on some buildings to reduce annual water run-off by at least 50% …”. 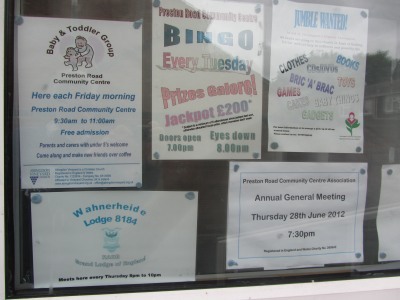 There is Bingo every Tuesday at Preston Road Commuity Centre, and has been for many years. Doors open at 7pm. Eyes Down at 8pm. The bingo was started by Abingdon Boys Football Club (now called Abingdon Youth Football Club) at Tatham Hall ( now called the Northcourt Centre) in the 1970s, and moved to Preston Road when the football club moved from Box Hill Recreation Ground to Southern Town Park. 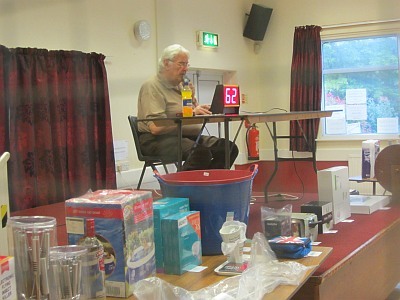 Bingo was a useful fund raiser for the football club and when they decided to stop running bingo, Preston Road Community Centre Association took up running the bingo to help raise funds for improvements to the centre. This evening was the AGM of Preston Road Community Centre Association. 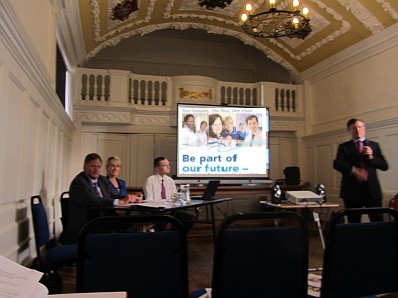 In the Roysse Room at the Guildhall this evening Oxford University Hospital NHS Trust came to do the first of a series of consultation events as they plan to become a Foundation Trust. Next consultation is at Faringdon on Tuesday. Last November the Nuffield Orthopaedic Centre and the Oxford Radcliffe Hospitals NHS Trust merged to form this trust with four hospitals: John Radcliffe, Churchill, Nuffield Orthopaedic, and Horton General. 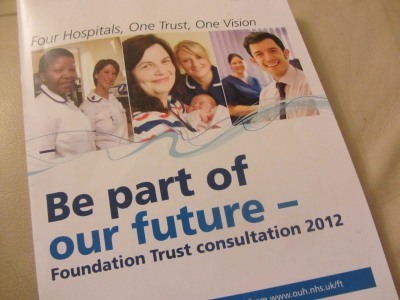 Becoming a Foundation Trust will give the trust more control over their own affairs within the NHS but they need members – some of whom will be staff, and some members of the public. It is easy to become a public member. Just go to Oxford University Hospital NHS Trust and fill in the form. Members of the public will elect most of the people on the board of governors. Members can even stand to become governors if they have the time. It was an interesting evening, with some interesting questions from members of the public. I did not see any councillors there but the town council had their own meeting at the same time to discuss the proposed reduction of the number of district councillors in Abingdon from 14 to 10. That will mean ward boundaries will need changing and possibly the number of town councillors will need reducing from 21 to 20 or 15. The town council also discussed The Guildhall in a secret session. 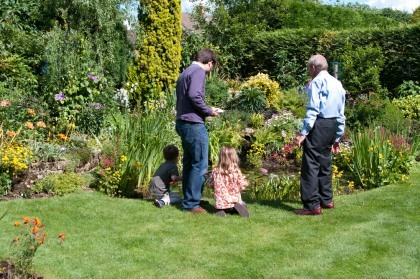 On Sunday Barry and Beryl Stayte opened their lovely garden to raise funds for Friends of Radley Lakes. 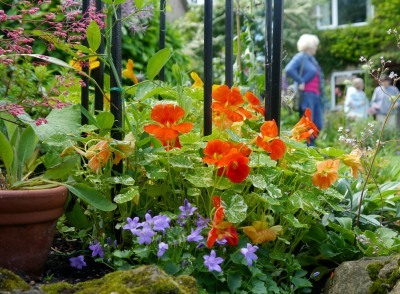 This garden is particularly special as it won two awards in the 2011 Abingdon in Bloom event – the Best Back Garden and the Best Wildlife Garden. A good time was had by all as the sun shone all afternoon, the homemade cakes were delicious and the garden looked stunning. 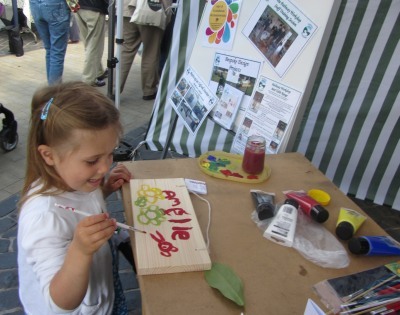 Thanks to Marjorie White for this report … The pond dipping picture is by Lynda Pasquire and the other two by Maggie Harnew. 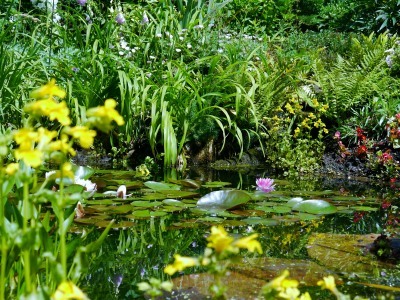 There will be another three open gardens this weekend on Saturday 30 June 2012 in East St. Helen’s Street. £5 will cover the entrance to all the gardens. Part of Abingdon Museum Friends fundraising.